Cows are really the most useful animals to humans. They provide milk which is one of the most important sources of protein. It is also rich in vitamin D and calcium which will keep our bones and teeth healthy. Also, Milk can be used to make dairy products like ghee, cream, butter, yogurt etc. Even cow dung is being used as a manure and it is helpful in growing plants. Farmers across the world use cow dung in agriculture. Last but not least, cow urine commonly known as “Gomutra” is one of the essential parts of Ayurveda medicines. It is also used to plough the land. The calf is one of the cutest baby animals in the world. On an average, cow chews at least 50 times per minute and used to stands up and sits dowm 14 times a day. Chickens are one of the subspecies of the red junglefowl. It is one of the most common domestic animals with a population of approximately 19 billion in 2011. Now, the numbers have been increased in folds. Chickens can make excellent pets just like dogs. They will help you keep active and lower your blood pressure. It also requires the same amount of companionship and care as a dog. They are also one of the most emotionally intelligent creatures. Also, you did not have to buy another egg from the market. It will take approximately 18 to 24 hours for a chicken to produce an egg. Also, chicken poop is also one of the most valuable fertilizer. Chicken feathers also have a variety of uses. It will also eat a lot of pests in your home. One of the most interesting facts about the chicken you dont know is that there are more chickens than humans. Approximately 25 billion chicken exist in the world. Also, they are more than any bird species on planet Earth. Horses belong to the subspecies of Equus ferus. Humans are using horses for centuries for different purposes. During the early days, they were a food source. However, later they are being used as a mode of transportation. They also helped humans by pulling heavy loads on them and carrying wagons. They are also very helpful in farm work, ploughing, leisure riding, races, and companionships. Horses are being used in Ancient Egyptians, the Arabs, and the Mongols civilizations. Also, native Americans are very fond of horses. It is also one of the friendliest animals in the world. The animal species has been domesticated for more than 5,000 years and have one of the biggest eyes than any other mammal that lives on the Earth. Dogs are not only the most popular pets around the world but also one of the most useful animals to humankind. However, a different type of breeds like small dog breeds, large dog breeds and big dog breeds are popular in different parts of the world. Let me tell you with an example, Americans love Labradors and German Shepherds but Chow Chow and Tibetan Mastiff are popular in China. Dogs help humans to boost their oxytocin levels with the help of their eyes. Dogs also help humans in getting out of deep depression with the help of their companionship. There is various research that suggests that Dogs are helpful in boosting your immune system. As per reports from the American Heart Association, dogs help us in lowering our blood sugar which has again multiple health benefits. Dogs can also detect cancer. All dogs are considered as the descendants of wolves and one of the unique features of the breed is that they are capable of locating sound in 6/100ths of a second by using their swivelling ears like radar dishes. Sheep are one of the most versatile among all domesticated animals. However, sheep are well known for wool. Humans use wool widely in clothing right from socks and jumpers to suits and costumes. Lanolin is also extracted from raw wool during the scouring process. Lanolin consist mixture of esters, alcohols, and fatty acids and they are used in auto lubrication, motor oils, adhesive tapes, and printing inks. They are also used in pharmaceuticals and cosmetics. Sheepskin is also used to make soft leather. Also, some of the famous cheeses around the world are made from sheep’s milk. Sheep have also used in science and medicine. They are used in stem cell research. Sheep cubs known as lambs can walk minutes after they are born, however, they are dependent on their mother for the first four to six months of their lives. The animal species can recognize 50 other sheep faces and can remember them for 2 years. 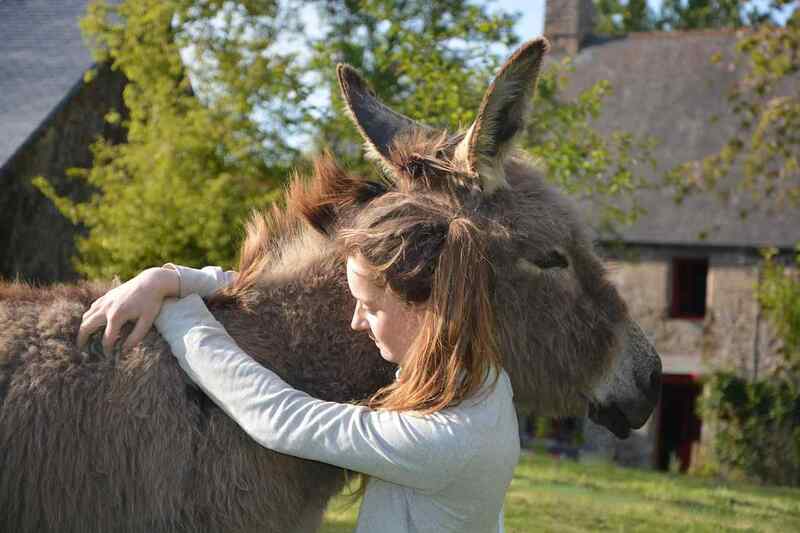 Donkeys are also one of the most useful animals to humans. They are mostly used to protect livestock such as horses, goats, and sheep from coyotes and wolfs. Donkeys are very good at alerting you from any kind of danger. They are also used to bring people up in the mountains. \They are the source of transportation in many parts and they carry heavy things for humans. Donkeys are also one of the cheapest forms of agriculture power. By nature, Donkeys are herd animals and loves to stay in groups, howvever, the single donkey can stay happily with a group of goats. Pigs are most useful as picky eaters. They often eat all surplus crops and food by-products that humans will not eat. Pigs are raised both at the individual and industrial scale. Pork’s is still one of the most popular kinds of meat among humans. Pig heart valves are even used as a replacement for failing heart valves in humans. In France, they are being used to find black truffles, one of a delicious yet notoriously difficult delicacy to find. Pigs are also one of the most social and intelligent animals. They usually form loose bonds with humans and love close contact. Also, they love to be lying down to humans. Pigs usually keep themselves clean and keep their toilet area far away from where they lay down and eat. Elephants are one of the most important creatures on planet Earth. One of the most important roles of elephants is to maintain the biodiversity of the ecosystem in which they survive. They are used by humans for labour and transportation. However, elephants are under threat because of the ivory trade and habitat loss. Asian elephants are being used by humans since the Indus Valley civilization of the 3rd millennium BC. Tusk of elephants are also useful as toilet bowl scrubbers and shampoo. Elephants trunks are useful in healing mental illness. Camel is also one of the most useful domesticated animals. They can survive for a full week without eating and drinking. Also, they can carry heavy loads up to 300 kilometres a day. Camels store water in their humps is one of the most common myths about animals. Camels tell about direction so they help us in reaching the destination without getting lost in deserts. Humans also use camels milk and make cheese from it. They are often called “ships of the desert”. Camels droppings are used as manure(fuel). So, camels are one of the most useful animals in the service of mankind. It also comes in the world’s most amazing animals. Camels milk is very rich in iron, minerals and vitamins and it is considered much healthier than the cow’s milk because of the less fat. The average lifespan of the species is 40-50 years. Humans easily digest goat milk. It is one of the best alternates for infants and people who have a problem with cow milk. Also, cured prepared with goat’s milk is smaller and more digestible. Cashmere goats produce the best fibre. It is also one of the best wool in the world. It is extremely fine and soft. Humans also use goats skin to create boots, gloves and many other products. Goat meat is called chevon and it is quite similar to lamb meat. Goats are one of the most useful animals in both conditions when they are dead or alive. These are the useful animals to humankind. Do post your comments.